Investment Risk: What Risks Are You Willing to Take? Stocks For the Long-Term….What About Your Term? The first reaction to the chart below is – a no-brainer – stocks compound at a much higher rate than bonds and inflation; therefore, put your money in stocks for the long-term! Yet we know that in the last 15 years we have seen two investment booms that went bust in a very short time period. Stocks declined over 50% in 18 months; there have been several longer term stock declines throughout history. Statistical certainty of future returns does not exist, and this presents a challenge to managing portfolio risk. Time horizon is a key element to consider. A younger person with a long time horizon can better handle this type of market risk. However, as you near retirement age, this kind of decline can cause very real anxiety. Understanding the relationship between the various risk and rates of return inherent in every asset class is fundamental to constructing an investment plan that can help you sleep at night. Investors face many different forms of risk depending on the type of investments they choose. Most of the focus on risk is on how much can be lost. However, less obvious risks such as loss of purchasing power also can be detrimental to your financial health. 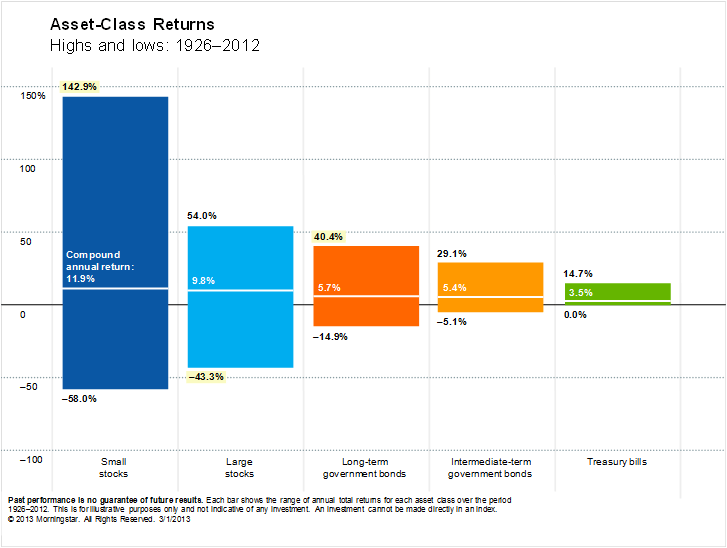 Assets that have higher return potential also have higher loss potential as illustrated in the chart below. A 70-year old retiree on a fixed income is not well suited to own a large allocation to small stocks with the potential for 60 percent losses. Since no one has a perfect crystal ball into the future, the best strategy is to create a mix of assets that balance the need for return, with the need for safety. Many factors, financial and psychological, go into determining an appropriate mix. What Purpose Does the Asset Serve? The best way to think of asset classes is in terms of what function they serve in a portfolio. Growth, current income, stability, and inflation protection are all key portfolio functions whose weight will depend on your specific circumstances. For most people, time horizon dictates the priority of these functions, and is defined by the number of years until reach retirement and/or their expected life span. Below we highlight various risks and how they can be mitigated in balancing the tension between time, risk, and return. 1) Market risk: General market fluctuations can affect securities trading in that market. Stocks, while offering the best long-term returns and protection against inflation, tend to fluctuate more than other asset classes (such as bonds) and usually pose more risk over short time periods. To mitigate this risk, we recommend diversifying assets to help minimize these short-term fluctuations. The amount of stock exposure is usually associated with time horizon. Longer time horizons can afford a higher exposure to stocks, while shorter time horizons will likely wish to reduce this exposure. 2) Industry/company risk: Security values can decline due to negative developments within an industry or company. This can involve management issues, loss of market share, and loss of profitability among many other fundamental factors. Using broad-based index funds which hold many companies serves to minimize this risk through diversification. 3) Credit/Default risk: This is the risk of a bond issuer not being able to make timely payments of principal and interest. The value of a bond may also decrease due to financial difficulties or the declining creditworthiness of the issuer. Once again, diversification can lessen this type of issuer specific risk. 4) Interest-rate risk: Bonds generally experience lower volatility than stocks and serve as a stabilizing force in portfolios. Likewise, they generate steady income that can be used for living expenses. Still, bonds can be risky investments. Bonds tend to rise in value when interest rates fall and to fall in value when interest rates rise. Typically, there is greater price volatility associated with longer-term bonds. Income and liquidity needs are important considerations when structuring a bond portfolio. There are strategies to spread this risk over short, mid, and long term maturities. Implementing these strategies will depend on the investor’s priorities as well as the interest rate environment. 5) Call/reinvestment risk: As interest rates fall, bonds with call provisions may be called in by the issuer prior to maturity. This may leave the investor with the problem of reinvesting the principal at a lower interest rate. 6) Inflation risk: This is also known as purchasing power risk. Inflation is a rise in the general level of prices for goods and services. If investments do not keep up with inflation, an investor’s money will purchase less in the future than it did in the past. 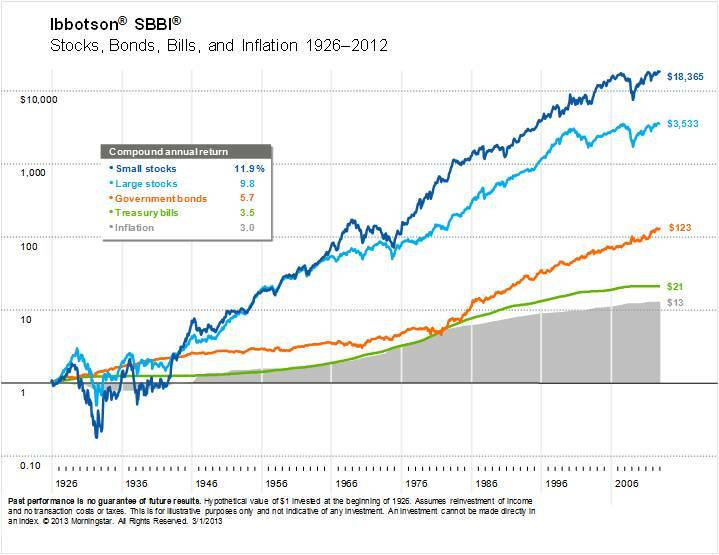 Stocks historically have offered the most protection against inflation, while bonds offer the least protection. Commodities and real estate have also been good protection against inflation. 7) Liquidity risk: Some investments may not be widely held by the public and may be difficult to sell if prices drop dramatically. We only purchase highly liquid investments traded on the public exchanges. 8) Currency risk: Currency exchange can affect the returns of a foreign security because foreign exchange rates constantly fluctuate with changes in the supply and demand of each country’s currency. Thus, returns achieved by local investors are often quite different from the returns that U.S. investors achieved—even though both are investing in the same security. Gold, while a commodity, is often referred to as a “store of value” because it has held value against every currency in the world. Gold is also a good diversifier in a portfolio as it has little or no correlation to the stock market. 9) Political/economic risk: Investments in a foreign country can be affected by the political and economic developments within that country as well as across the globe. The range of these risks is as broad as they are difficult to predict including war, currency devaluation, fiscal policy, monetary policy, and regulatory changes to name just a few. Globalization has made geographic diversification harder to achieve as foreign assets have become much more correlated to the U.S. markets. 10) Fee risk: You will not see this risk prominently featured in any broker or adviser marketing materials. Fees are a material cost to an investor and should be very well understood before entering into a relationship with an investment professional. Lack of transparency often makes this difficult. Our flat fee model removes a large portion of this risk. No investment is without risk. Even cash, whether held in the bank or under the pillow, is subject to inflation risk and loss of purchasing power. There is an inverse relationship between risk and return. Time and liquidity needs are key considerations. Our investment plan will identify which assets are most relevant to achieve your goals, which risks are most detrimental, and accordingly structure a portfolio to mitigate these risks with your return requirements. Investors cannot invest directly in an index. These unmanaged indexes do not reflect management fees and transaction costs that are associated with some investments. Past performance does not guarantee future performance. All investments are subject to risk, including possible loss of the money you invest. Diversification does not guarantee profit or protect against a loss. Nothing herein or elsewhere on this site constitutes investment, legal, or tax advice. Please see the Disclosure link at the bottom of the page for more detail at www.compoundvalue.com/disclosure/.